Dry Erase Newborn Feeding Tracker. Baby Shower Gift. 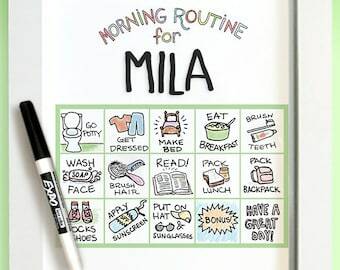 GREEN Dry Erase Baby Chart. Baby Feeding Last Feeding Tracker. A darling DIY baby shower gift any new mom will love! Purchase, download, print, and place in a 5x7 frame to make a gift mom will truly appreciate. In green for your gender-neutral nursery. With your bundle of joy comes sleep deprivation like you’ve never experienced. When you think to yourself, “I JUST fed you 10 minutes ago!” the Dry Erase Newborn Feeding Tracker can set you straight. Don't hunt in the dark for your spreadsheets, just know at a glance that it is feeding time, and latch that baby on the right side. 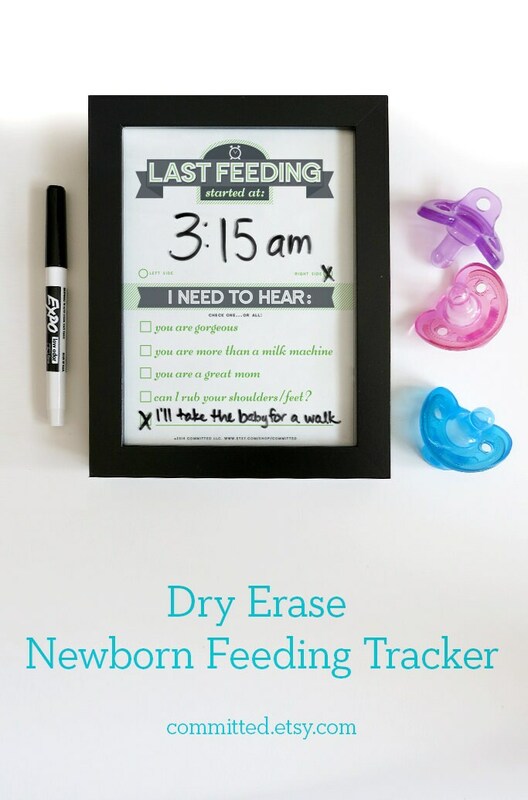 Not only can you record the time of your last feeding, the Dry Erase Newborn Feeding Tracker makes it easy to tell your partner what you need. When that cute awakening does come, just check a box! Your partner will know exactly what to do to help! This is the most thoughtful gift for a new mom you can give! Make sure she's at the forefront, even if baby is getting all the attention! Large space for tracking the last feeding makes it easy to read in a dimly-lit room. Note which side you fed last (or mark ounces if bottle-fed). Communicate with your partner exactly what you need (a confidence boost, a latte, a break, a shower). How do I get my file? - Once payment clears, your Invoice page will have a link that says "Download". How do I print my file? - Files are in pdf format, which requires Adobe Acrobat (free to download from their website). - Download the file and print at home, or put on a jump drive to print at your local print shop. - Be sure to print at "Actual size" or "100% size" and best quality. How do you make it dry erase? - After printing and trimming, place in a 5x7 frame with a glass face. Be sure to include a dry erase marker, if gifting. Can I use a larger frame? - Sure! Just print at 140% of actual size to fit in an 8x10 frame. - Beware that nightstands get cluttered when you're a new mom. The 5x7 size has proven to be the most efficient. - Nope! Your download gives you the right to gift as many as you like, but you may not share files, sell files, or sell prints (framed or not). You also may not copy the artwork to sell as your own. This is registered with the Library of Congress and enforceable by Copyright law. There are free spreadsheets all over the internet! Why would I buy this? - Spreadsheets are great for keeping track of baby's information, especially for pediatrician appointments, however, the Dry Erase Newborn Feeding Tracker contains just the information MOM needs. - Spreadsheets get spread everywhere. The Dry Erase Newborn Feeding Tracker stays right next to the bed or glider. - You can note ounces fed instead of which side. - Still handy for noting last feeding at a glance. - Moms still have needs and are recovering, even if they are not breastfeeding. Can you customize this for my child's name/nursery colors? - Sorry, no customization is available. **Sales tax applies automatically to Seattle and Washington state residents. ©2017 Committed LLC. All rights reserved. Committed supports parenthood survival, keeping you organized and smiling as much as you can with limited sleep and minimal showers! Caring for a baby or youngster is tough, and we can help make it easier with our line of well-designed and thoughtful products. Baby Shower Gift: Dry Erase Newborn Feeding Tracker for New Moms. Pink Dry Erase Baby Chart. Baby Feeding Last Feeding Tracker. Printable. Baby Gift Printable: Dry Erase Newborn Feeding Tracker, Navy Blue | DIY Baby Shower Gift. Last Feeding Tracker. Baby Feeding Chart. Printable: Dry Erase Baby TRIO, Navy Blue | DIY Baby Shower Gift. Last Feeding Tracker. Baby Feeding Chart. Sleep Tracker. Chore Chart. Printable: Dry Erase Baby TRIO, Green | DIY Baby Shower Gift. Last Feeding Tracker. Baby Feeding Chart. Sleep Tracker. Chore Chart. Printable: Dry Erase Baby TRIO, Green | DIY Baby Shower Gift for Mums. Last Feeding Tracker. Baby Feeding Chart. Sleep Tracker. Chore Chart. Printable: Dry Erase TRIO Newborn Feeding Tracker, Sleep Tracker, Chore Chart, Pink | DIY Baby Shower Gift. Last Feeding Tracker. Super easy to print. 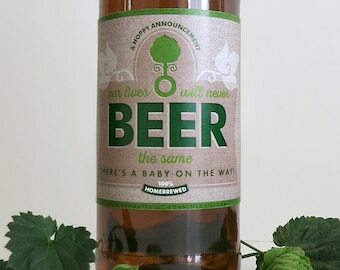 Unique addition to a baby shower gift. This is absolutely wonderful and I cannot wait to gift it! I like that it can be printed as different sizes and comes with a wonderful instruction sheet. Payment is due upon order placement. Orders will be shipped once payment is confirmed via Etsy or PayPal. Committed is based out of Seattle, WA. Sales taxes are applied based on state and local guidelines. There are no refunds for digital downloads. If you haven't downloaded your files yet, I can offer a refund within 7 days. Color for printables cannot be guaranteed, unfortunately. My monitor and your monitor have different settings, as does your printer. If there is an issue with how your colors are printing, please consult your monitor and printer manuals. I get the question: "Can you change ABC line to XYZ please?" Unfortunately, I cannot offer customization. I do have suggestions to tweak your printout to meet your particular needs. PLEASE NOTE: Files are for personal use only. You may not forward, share, sell or distribute the file. It is for non-commercial use only. Printing and making your own products for sale is a violation of terms, and it's just bad karma. All Committed products are registered with the US Copyright Office, and infringement is enforceable by law. All rights reserved by Committed LLC. By purchasing you agree to my shop policies. Like Committed on Facebook for some laughs and to keep up with my latest offerings. Sometimes I even have discount codes for my products!